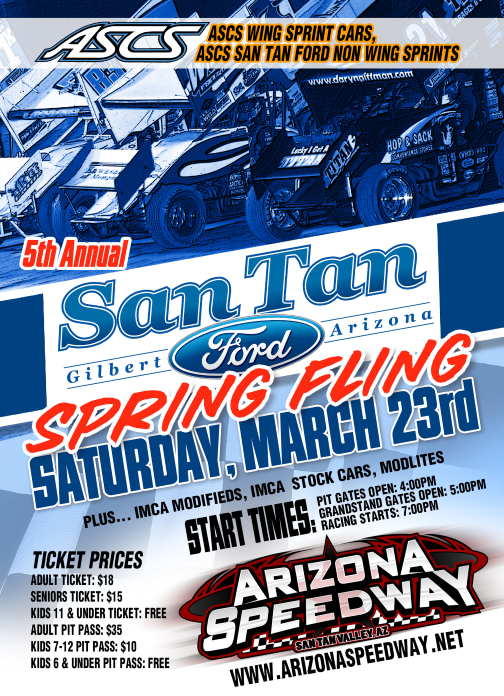 The 5th Annual Spring Fling presented by San Tan Ford explodes this Saturday night March 23 at Arizona Speedway. Headliners fill the card of this blockbuster event with ASCS Wing Sprint Cars, ASCS Non Wing Sprint Cars, IMCA Modifieds, IMCA Stock Cars along with Modlites. The 2019 championship hunt will begin this Saturday night for the ASCS Wing division with 10 time and reigning champion Rick Ziehl leading the charge. Sidelined for 2018, Aaron Jones leads ASCS Non Wing division coming into the meet with Kelsie Foley leading the way in the IMCA Modified division with a win and a second on the season. Joey McCullough comes in at the top of the newly formed IMCA Stock Car division with Brenden Priest as the front runner of the Batz Wearhouse Modlites. Action begins at 7:00pm Saturday March 23 at Arizona Speedway with grandstands opening at 5:00pm and pits opening at 4:00pm. Cost for admission just $18 for adults, $15 Seniors. Kids 11 and under are free. Pit passes $35 , kids 6-11 pit passes $10 and kids 5 and under free. Arizona Speedway is located within ET Motopark at 48700 N Ironwood Dr. San Tan Valley, AZ 85140 5 miles south of US60 on Ironwood dr. Call the hotline for more info. 480-926-6688 . Follow us at www.Facebook.com/ArizonaSpeedway .